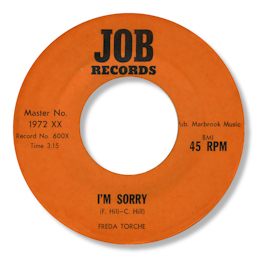 The famous JOB record company of Chicago was really running out of steam by the time this super one-off by Freda Torche was released. Not surprising at all as the label first started trading in 1949, but while its history was an integral part of the story of Windy City blues, its contribution to soul music was pretty much non-existent. So it’s a welcome surprise to find this 45. “Ain’t It Funny” is a funky little number of some distinction, but I’m Sorry is top of the tree. This dead slow ballad features a rousing vocal from Freda, full of tasteful gospel touches and few screams, over a very southern sounding band. Just right for me.